Introduction: Laparoscopic Surgery has rapidly increased for treatment of gastric cancer in the world. Laparoscopic assisted distal gastrectomy (LADG) has been the standard procedure in case of early gastric cancer. Our impression is obesity can be one of the factors to increase of operating time and blood loss. Methods: Between October 2007 and May 2009, 48 patients with preoperatively diagnosed early gastric cancer underwent LADG. 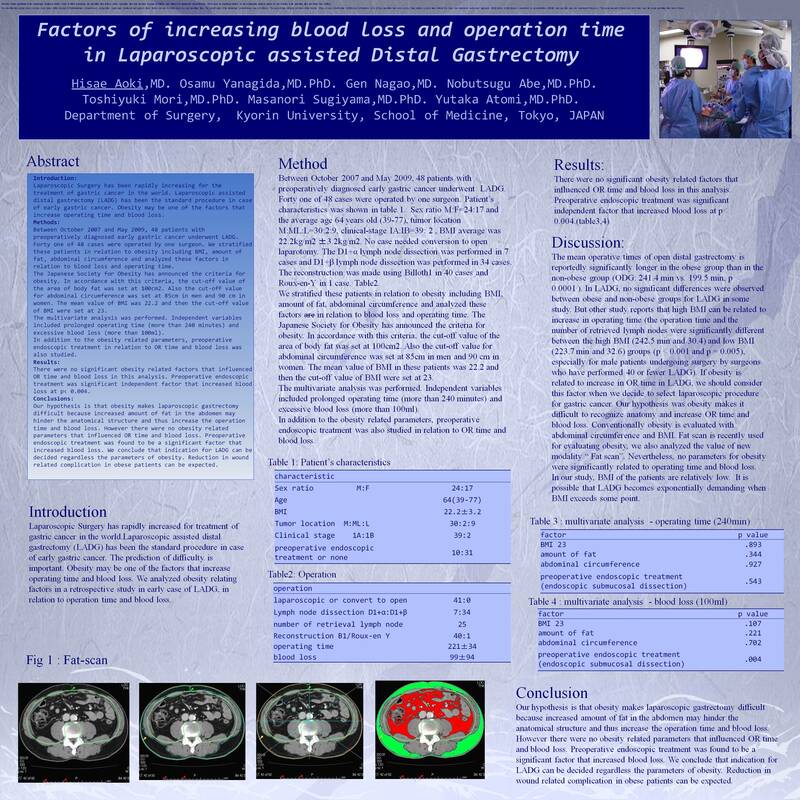 41 of 48cases were operated by one surgeon.We classified two groups based on body mass index (BMI), Amount of Fat,Abdominal circumference, preoperative endoscopic treatment and analysis those factors are able to relate blood loss and operating time. The cut-off value of the abdominal circumference was set 100cm2. The area of body fat were set 90cm at the female, 85cm at man. Cut-off value of BMI were set between 22 to 25.And operation time were set less than 240min or more than 240min.Ten cases has underwent endoscopic approach (ESD)before LADG.40cases underwent as reconstruction Billroth1 and only one case has underwent Roux-en-Y.The mean amount of blood loss were 99ml and the mean operating time were 219min. Conclusions: We expected that obese makes difficult to operate because of increasing amount of fat in abdomen and increase the operation time and blood loss .However there were no differences of blood loss between BMI >25 and 22~25.the endoscopic treartment before LADG was a significant factor to increase blood loss.We thought Fat scan was better than BMI to evaluate difficulty to operate , it has not been dominant factor.